I have two new pattern releases from October. 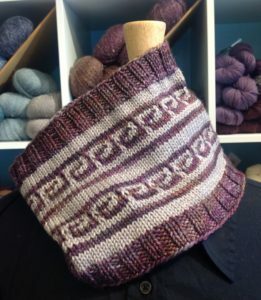 First is a free cowl pattern published on the Underground Crafter blog called the Meander Cowl. This is a quick to knit design that uses slipped stitches to create the colorwork pattern, so you’ll only use one color of yarn in each round. You can find it free on the Underground Crafter blog. 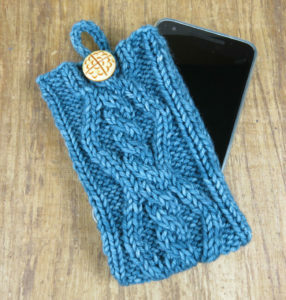 My second pattern from October is a little Cabled Phone Cozy. This pattern is a great introduction to cables and it showcases a special button. It also makes a quick to knit gift for someone special. You can find it for sale on Ravelry. Speaking of sales, the Indie Gift a Long starts tomorrow. Over 300 participating indie designers have thousands of patterns on sale for 25% off through November 28th, 2017. Then you can join in knit and crochet alongs for the rest of the year and win some great prizes! Check it out! You can find my patterns for the Gift a Long in bundle on Ravelry.